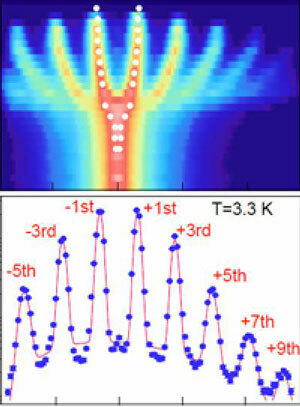 (Nanowerk News) Normally a material can be either magnetically or electrically polarized, but not both. Now researchers at the Niels Bohr Institute at the University of Copenhagen have studied a material that is simultaneously magnetically and electrically polarizable. This opens up new possibilities, for example, for sensors in technology of the future. The results have been published in the scientific journal, Nature Materials ("Solitonic lattice and Yukawa forces in the rare-earth orthoferrite TbFeO3"). Materials that can be both magnetically and electrically polarized and also have additional properties are called multiferroics and were previously discovered by Russian researchers in the 1960s. But the technology to examine the materials did not exist at that time. It is only now, in recent years, that researchers have once again focused on analyzing the properties of such materials. Now you have research facilities that can analyze the materials down to the atomic level. "We have studied the rare, naturally occurring iron compound, TbFeO3, using powerful neutron radiation in a magnetic field. The temperature was cooled down to near absolute zero, minus 271 C. We were able to identify that the atoms in the material are arranged in a congruent lattice structure consisting of rows of the heavy metal terbium separated by iron and oxygen atoms. Such lattices are well known, but their magnetic domains are new. Normally, the magnetic domains lie a bit helter-skelter, but here we observed that they lay straight as an arrow with the same distance between them. We were completely stunned when we saw it," explains Kim Lefmann, Associate Professor at the Nano-Science Center, University of Copenhagen. They were very strange and very beautiful measurements and it is just such a discovery that can awaken the researchers' intense interest. Why does it look like this? The experiments were conducted at the neutron research facility Helmholtz-Zentrum in Berlin in collaboration with researchers in Holland, Germany, at ESS in Lund and at Risø/DTU. They would like to get a general understanding of the material and with the help of calculations; and have now arrived at a more precise image of the relationship between the structure of the material and its physical properties. 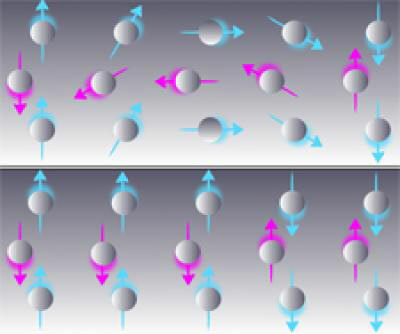 "What the models are describing is that the terbium walls interact by exchanging waves of spin (magnetism), which is transferred through the magnetic iron lattice. The result is a Yukawa-like force, which is known from nuclear and particle physics. The material exhibits in a sense the same interacting forces that hold the particles together in atomic nuclei," explains Heloisa Bordallo, Associate Professor at the Niels Bohr Institute. It is precisely this interaction between the transition metal, iron, and the rare element, terbium, that plays an important role in this magneto-electrical material. The terbium's waves of spin cause a significant increase in the electric polarization and the interaction between the ions of the elements creates one of the strongest magneto-electrical effects observed in materials. "Through these results we found a new pathway to discover and develop new multiferroics", emphasize the researchers in the group. Now it is up to further research to determine whether this new effect could lead to new applications of these materials with the amazing physical properties.